Hello and Happy Friday everyone! 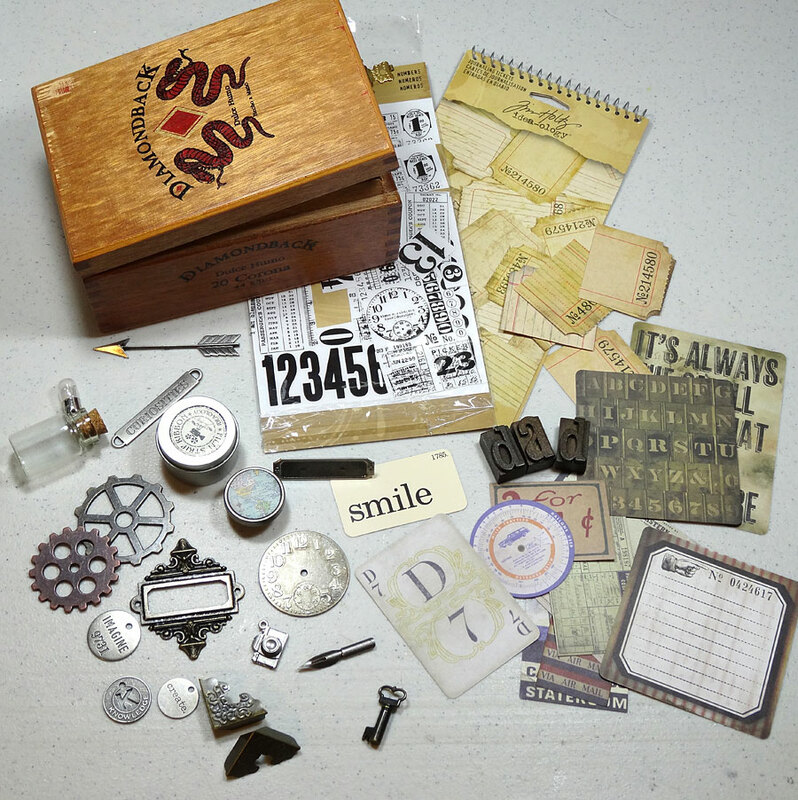 I'm excited to share my wrap-up post for the Creative Carte Blanche April Adventure: "Think Outside the Box" where I encouraged you to join us in altering any type of box, whether it be a cigar box or whatever you had on hand. We had such fun creations submitted on the blog. 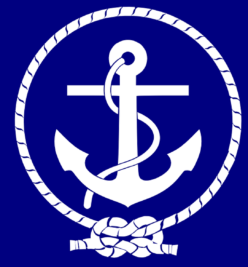 Be sure to check them out when you get a chance here. To close out this month's challenge, I'm sharing what I did with a wooden cigar box in my stash. I seem to collect these, and had plenty to choose from. I decided on a more rectangular one so I could alter it into a wall-hanging for my dad for Father's Day. Let me take you through my process. 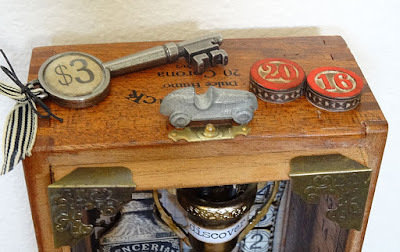 I started by gathering all kinds of things I think I might want to use. Lots of these items didn't make the cut in the end as you'll see. They were simply laid out to inspire me and give me options when I began the project. 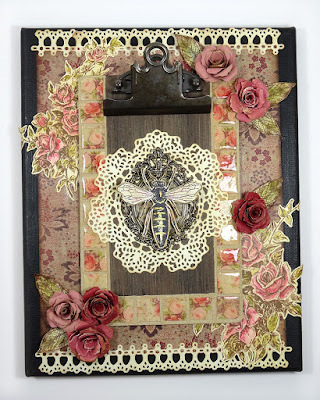 Almost everything here is from Tim Holtz Idea-ology which you can find in your local craft stores and favorite online stores. 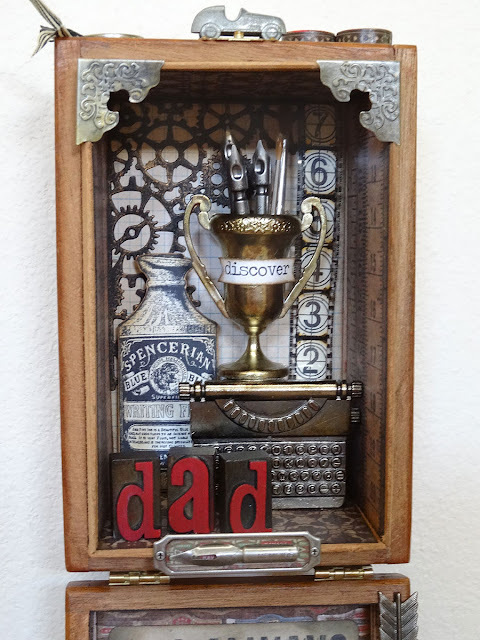 I knew I wanted to do something really different than just a box to put stuff in, and I knew I wanted to make something nice for my Dad for Father's Day. I noticed the last time I was at my parents' house that he needed some art on the walls in the computer/workout room (a place he spends a lot of time now that he's retired) so a wall-hanging it would be! I left the box its natural wood because the color was perfect, then I lined the insides of the box and lid with papers from Tim's Dapper paper stash. 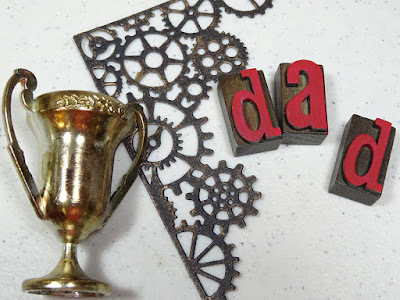 I prepped a few Idea-ology pieces with paint and alcohol inks, then die-cut the gears and "tarnished" them with paint. Inside the lid, I adhered Idea-ology pieces in layers using strong glue (E6000) after aging some of them with alcohol ink. I enjoyed using some old favorite items mixed with some new ones. See the camera, the light bulb, and the word tokens? They all hold a special meaning. At this point I'd like to share a little about my Dad. He's a creative, and he's been at it quite a long time. He was a freelance graphic designer working in our family basement when I was a kid in Michigan. He's from the old school: pen and ink, t-squares, photo stats, figuring type for the typesetter, drawing up storyboards; all that stuff before computers. Not only is he artistic, he's a fantastic photographer. Ever since I can remember, he's had a camera in his hand. He documented everything with his photography, even creating home movies with stop-motion animation intros and endings. We still watch those on occasion and I love them. Dad started a successful advertising agency in 1984 and just retired a few months ago at the age of 73! He loved to work because he loved his work. I really admire him for that. I worked for Dad when I first graduated college (and yes, I used those old-school tools and techniques too) and after freelancing on my own for a while, I returned to work with Dad again some years later. I got him to buy his first Mac computer (a good ol' Centris 650) and although he was very resistant at first, he gave in and we never looked back. Back to the project. 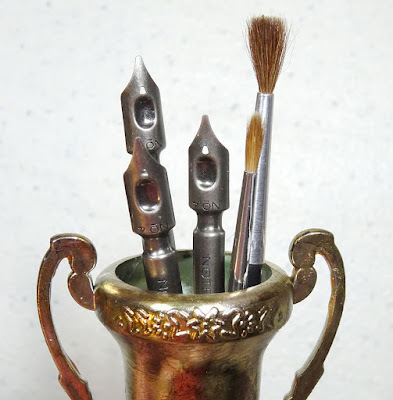 I wanted to put some items into the trophy cup so I attached a few pen nibs to wooden skewers and snipped some paint brushes to fit. I pressed some floral foam down into the trophy cup, then inserted the nibs and brushes. I covered the foam with a bit of moss (not shown here). To lift items forward and provide support, I adhered a wooden 1 1/2" block with foam tape to the back wall of the box for the typewriter to lean on and the trophy cup to stand on. 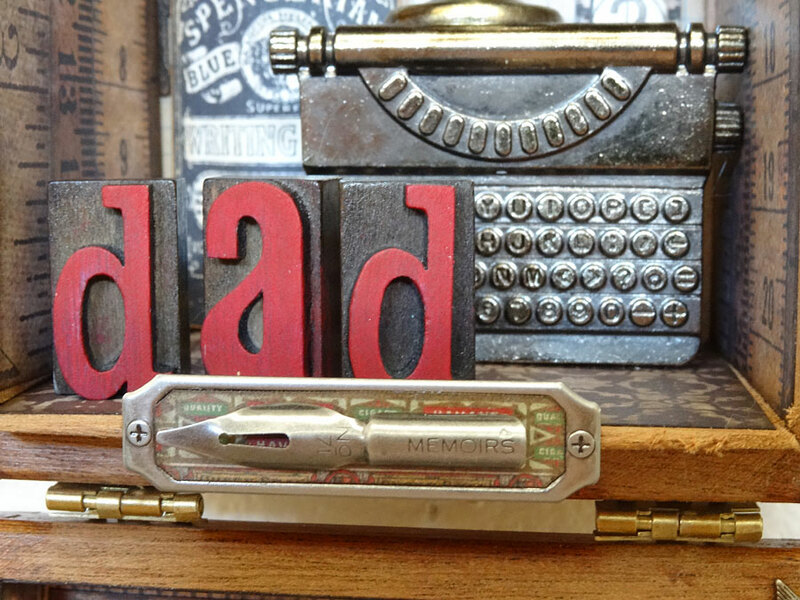 I got so caught up in the creative process, I forgot to stop and take photos as I layered the items, but here you can see the metal typewriter (because that's what we used at work back then), the stamped ink bottle, the metal plate with another pen nib, and the metal photo corners. Here's a little closer look. I got that typewriter quite a while back from the Michael's dollar bin. I snatched up a bunch of goodies like this and stashed them away. I love it when I find the perfect use for something I've been hoarding for so long. Dad also loves cars. I mean LOVES them. Always has. So I had to add this little Monopoly car to the top of the box along with some other goodies. 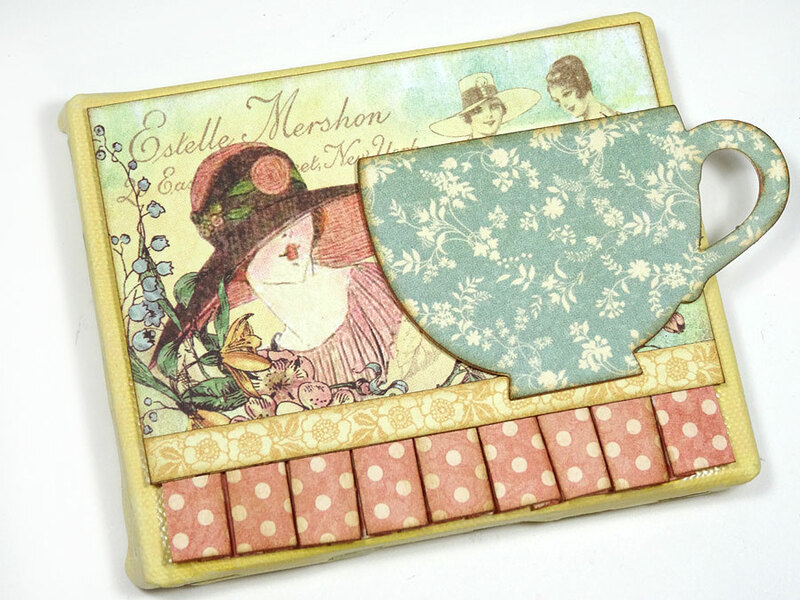 The lid of the box hangs freely and has this great ephemera card as it's focal point. 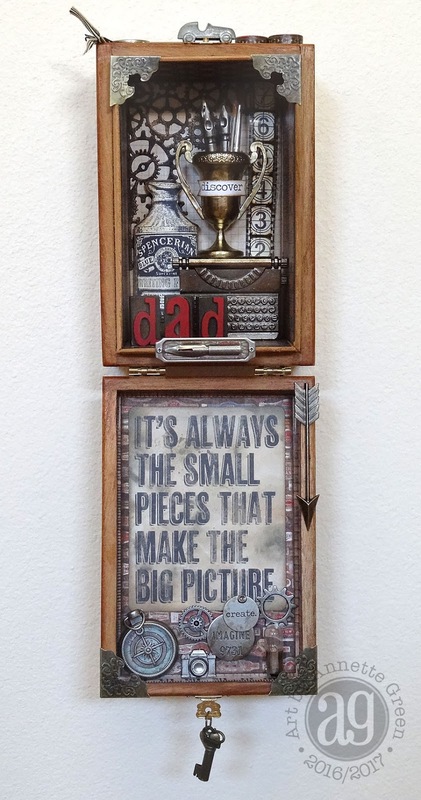 I love it, because all the small pieces in this project make the big picture of who Dad is, so this phrase was perfect. 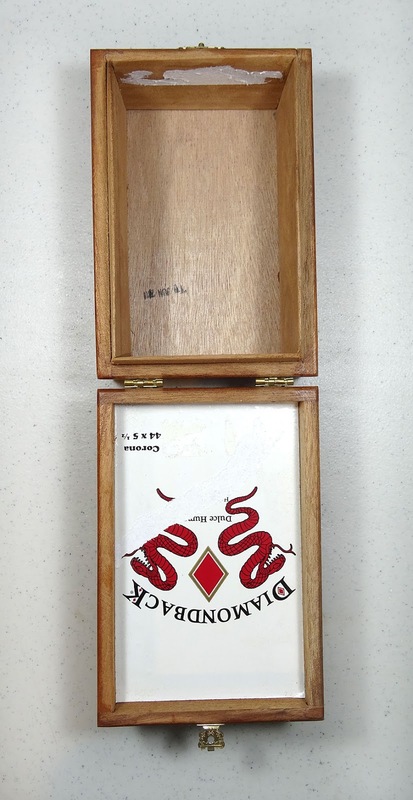 As a finishing touch, I added a heart charm and small key to the clasp of the cigar box with a brass jump ring. 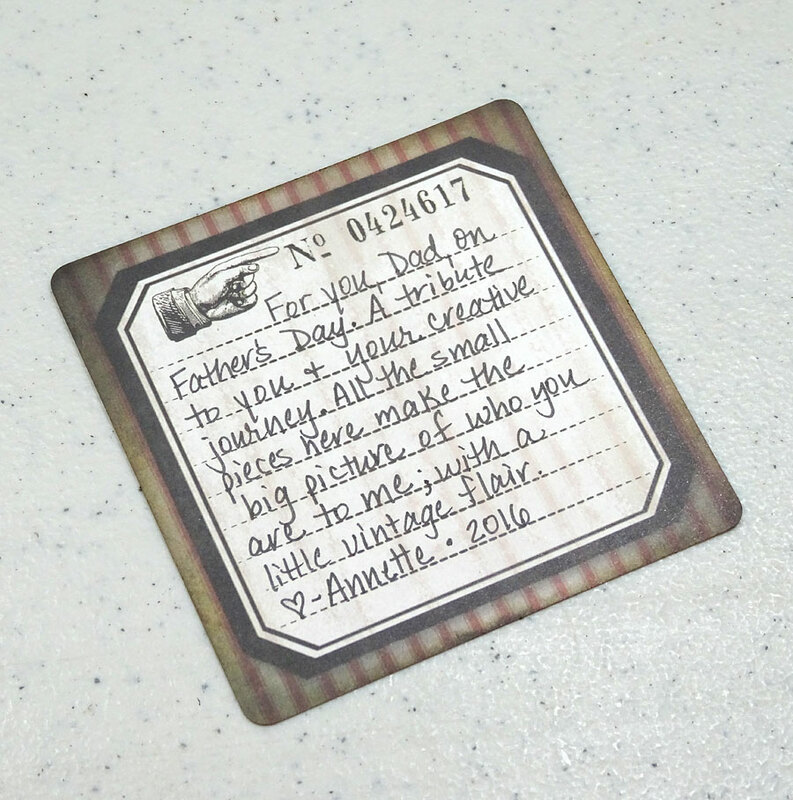 Onto another ephemera card I wrote this message to Dad and adhered it to the back of the box. Nowadays, Dad does a little creative work in his spare time for his local Corvette club. He's got nice big Mac computer, an iPhone, and Apple TV. 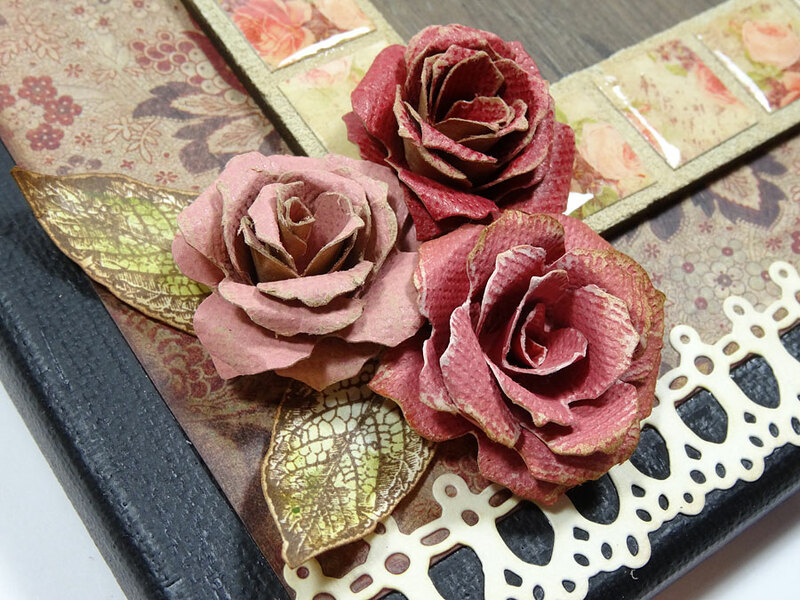 Thanks for joining me today and for playing along in this month's creative adventure. Be sure to check the Creative Carte Blanche blog May 3rd when Cheryl Grigsby announces the new adventure! I can't wait see what she comes up with. Hi everyone! I hope your week is starting off well. 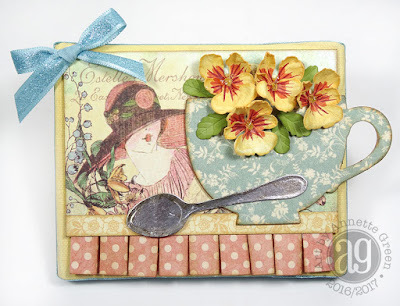 I had a super fun weekend teaching Graphic 45 classes in Lakeland at the wonderful Violette's Scrapbooking Store. 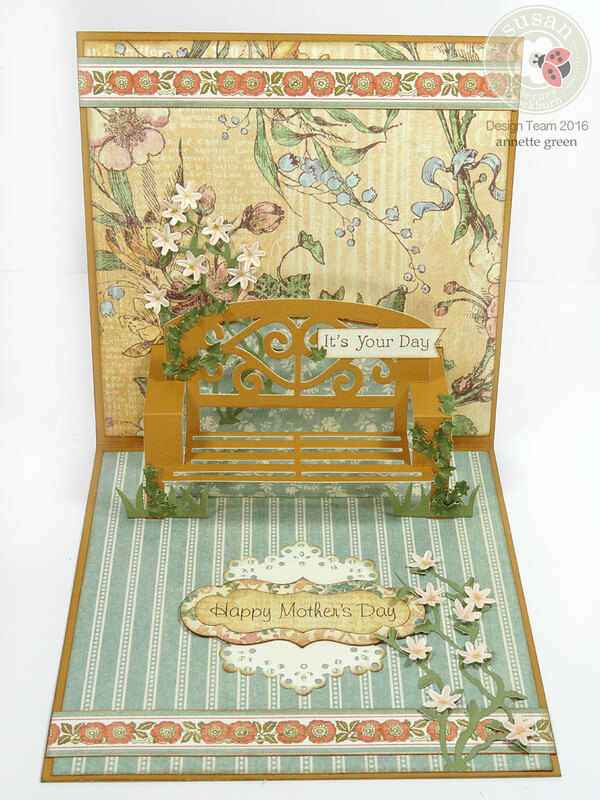 Today I wanted to share a very special Mother's Day I created for my Mom this year, using lots of great dies and stamps from Elizabeth Craft Designs. I'm featured on their blog today with this interactive card, so make sure to pop over there to check it out. I have a full tutorial there also. I adore this garden bench pop-it-up die, don't you? And the Susan's Garden dies work perfectly with it. I also used Graphic 45's "A Ladies' Diary" papers. 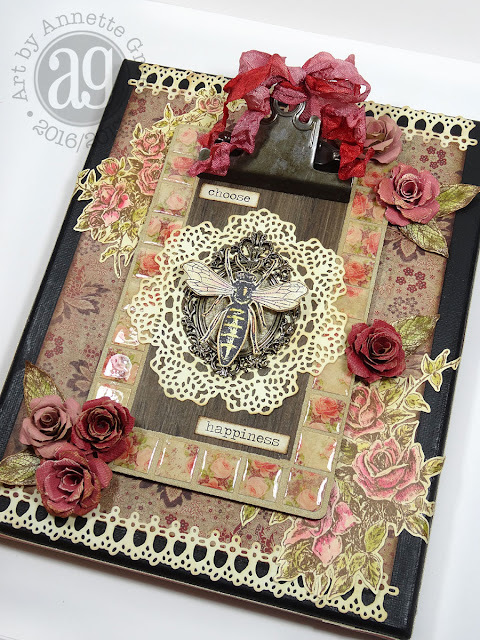 I hope you have time to check out more photos and the tutorial on their blog. You'll find it here. I know some people have some trouble leaving comments on their Wordpress blog, so if you are one of those people simply come back here and let me know what you think by leaving a comment on my blog. Thanks so much. Have a fabulous Monday! Good Monday morning all. 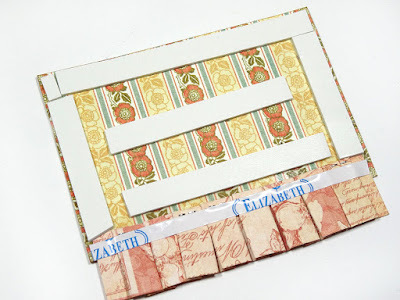 I've got a simple and fun little project to share today which would make a sweet little gift for a friend, Mom, or anyone special to you. 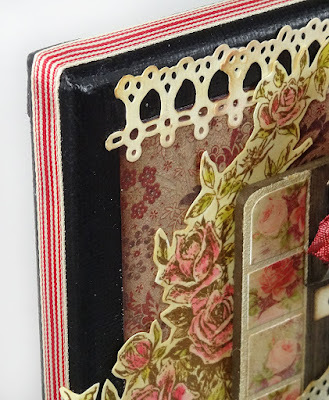 It's a miniature canvas adorned with Graphic 45 paper and dies from Elizabeth Craft Designs. This sweet little canvas measures only 5" x 4". 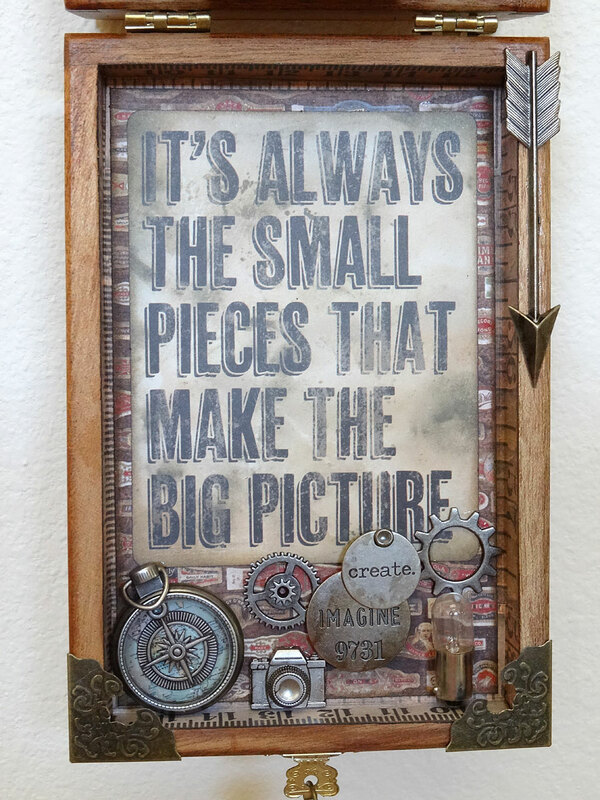 It would be perfect to prop up on one of those miniature easels. These can be found on the art/canvas aisle of your local craft store. 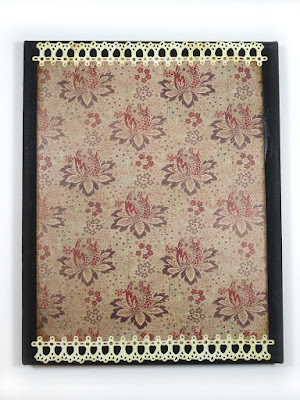 My canvas features papers from Graphic 45's "A Ladies Diary". Let me take you quickly through the easy steps to create it. 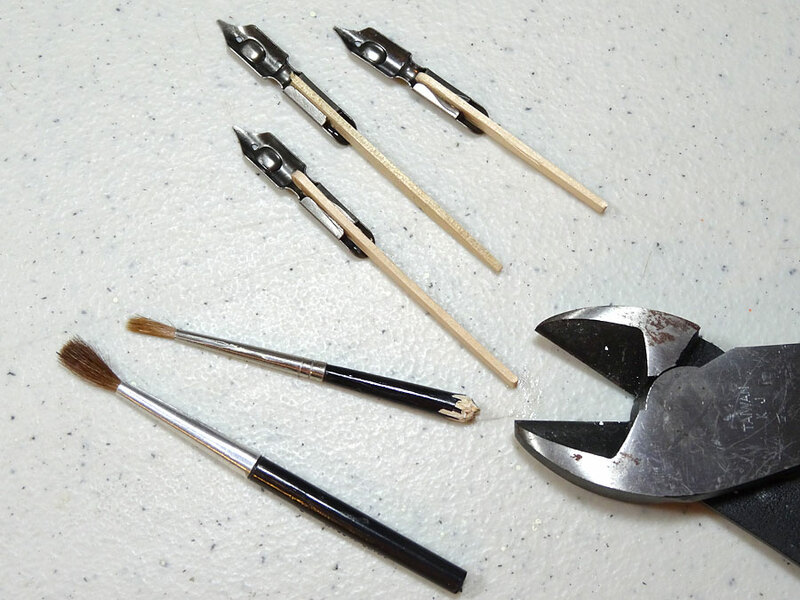 Paint the outer edges and sides of your canvas. 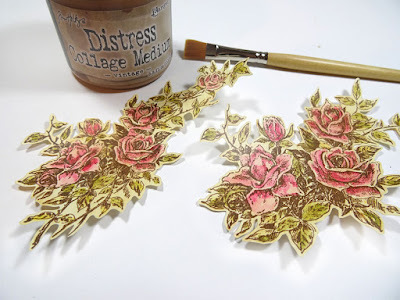 I used Scattered Straw Distress Paint from Ranger. 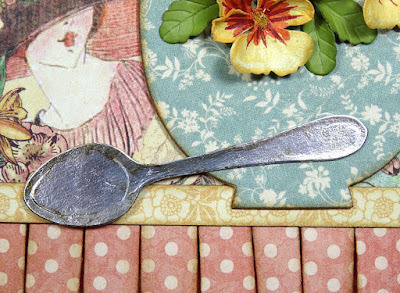 Die cut two cups and two spoons. 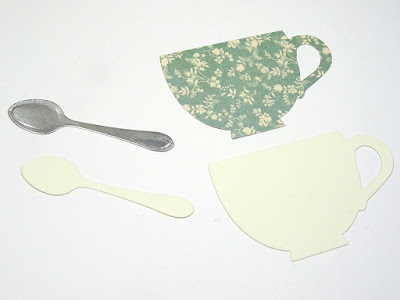 One of each is cut from ivory cardstock, one cup from pattern paper, and one spoon from silver metallic cardstock. I layered these together for stability. The cup and spoon are from the Cup Pop Stand die set. 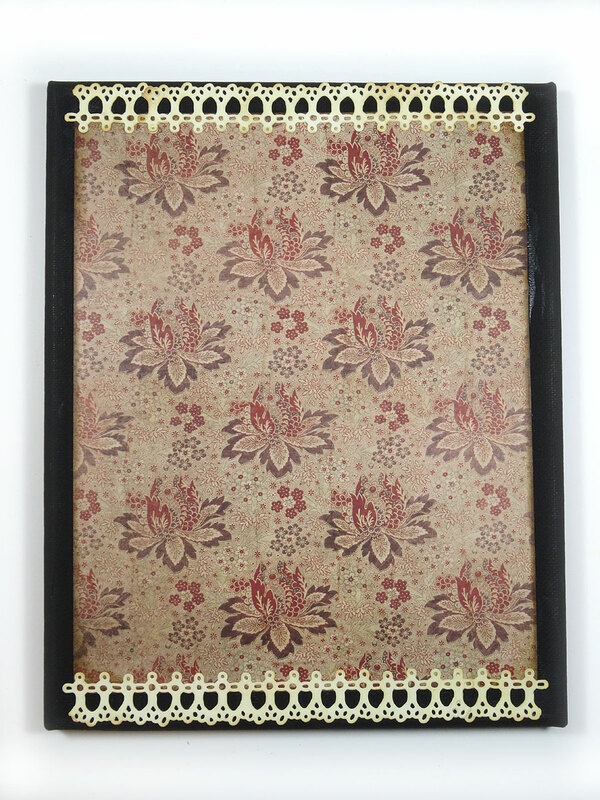 Cut a piece of pattern paper to fit the front of the mini canvas, and ink the edges. I used Vintage Photo Distress Ink. 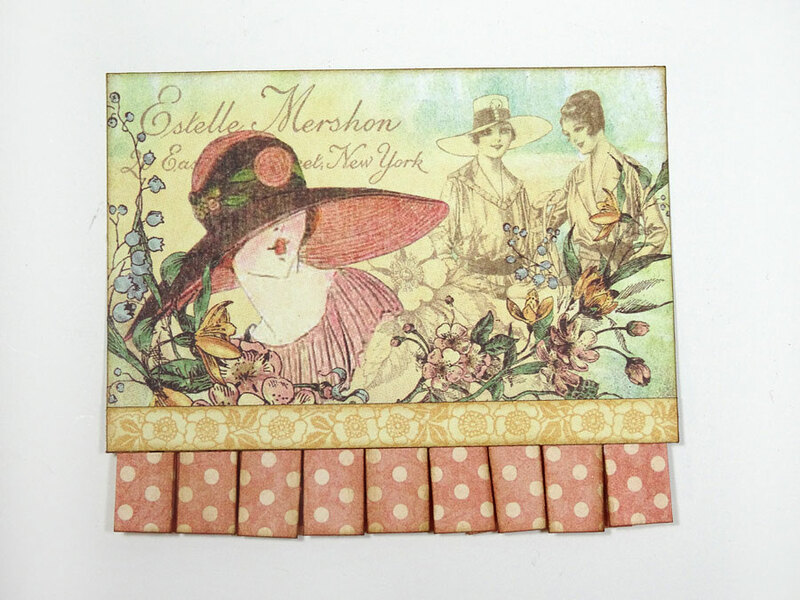 Cut a coordinating paper strip 1 1/2" x 12". 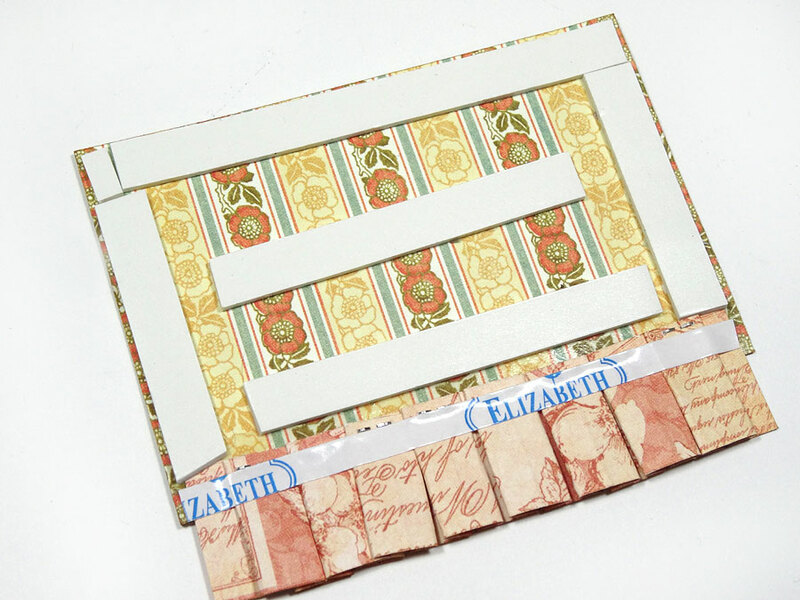 Score and fold to create a box pleat. I have an oldie but goodie YouTube video on various paper folding techniques including the box pleat here. Use a mini stapler to keep the pleats in place before adhering. Adhere the pleated piece to the back of the main paper piece, hiding the staples. 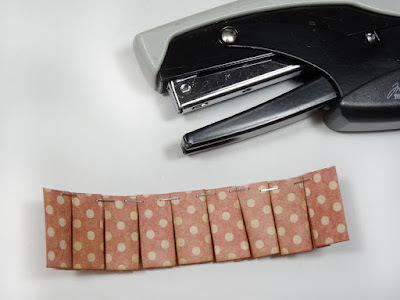 Place foam tape on the back of the unit on the area above the pleats, and double-sided sticky tape onto the back of the pleats as shown. 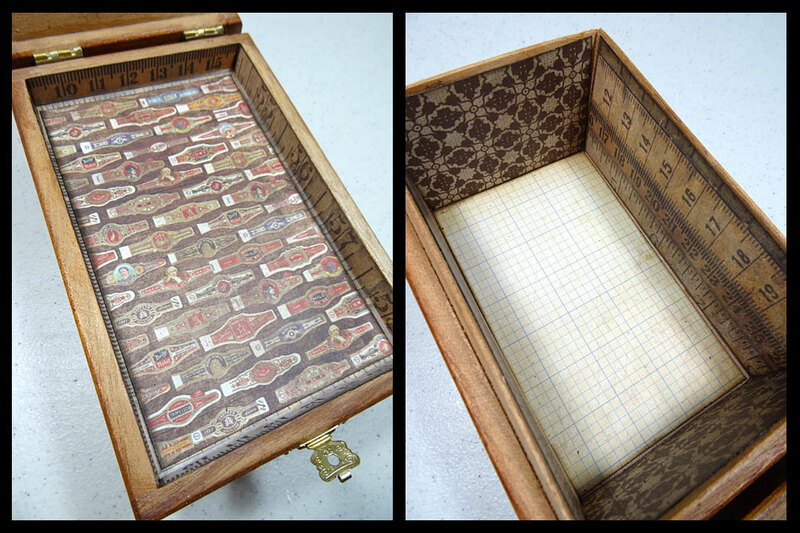 Adhere the unit to your mini canvas. 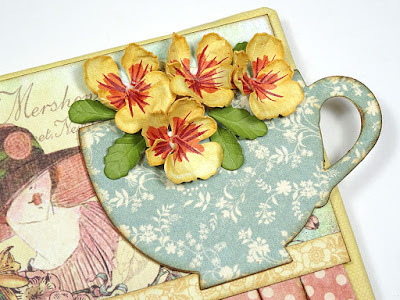 Add a 1/4" decorative paper strip across the seam, then add the tea cup with foam tape. 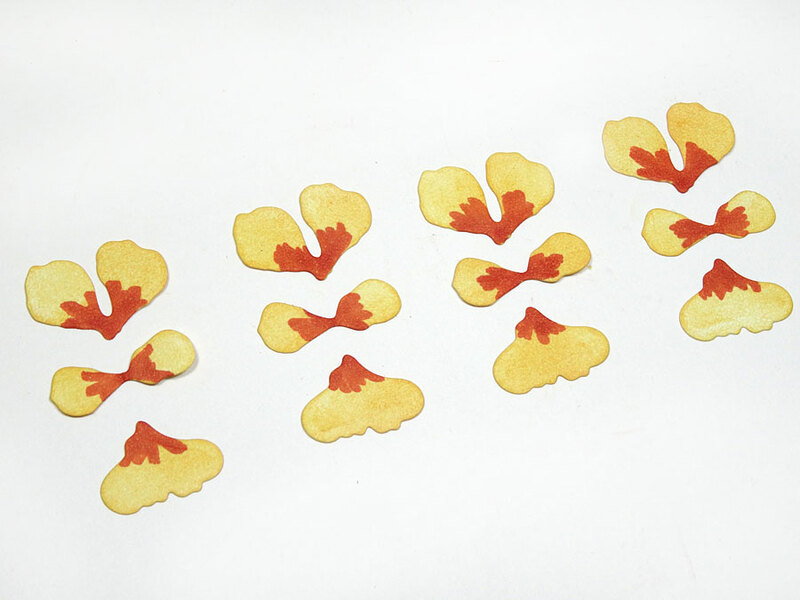 Die cut four sets of the pansy die pieces from white cardstock using the Susan's Garden Notes "Pansy" die. Color your pansy a desired color. I chose a soft yellow for mine, using Scattered Straw Distress Ink and blended it over the pieces. Then I colored the areas you see in the photo with a burnt orange Copic marker. 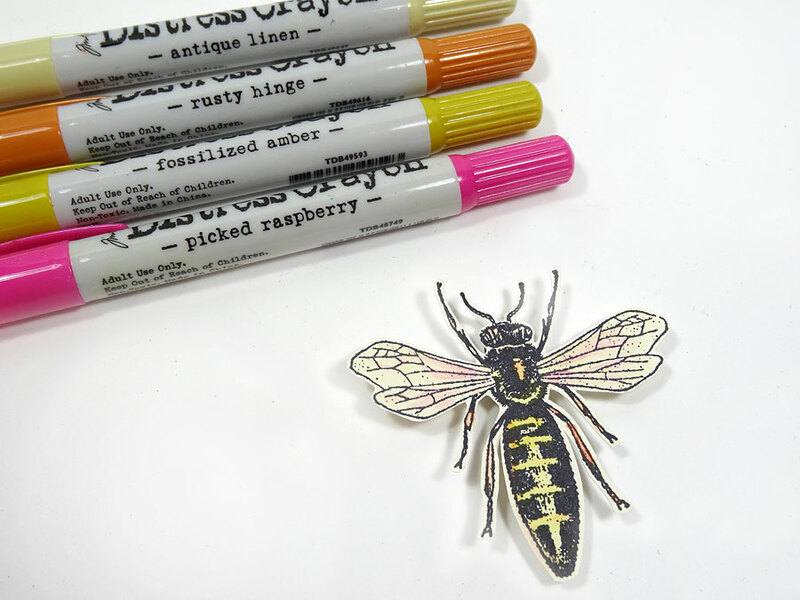 Use the fine point of a red Copic marker to draw quick strokes over the orange. Assemble the pansies as instructed by Susan in her video, then adhere to the canvas, adding the leaves too. 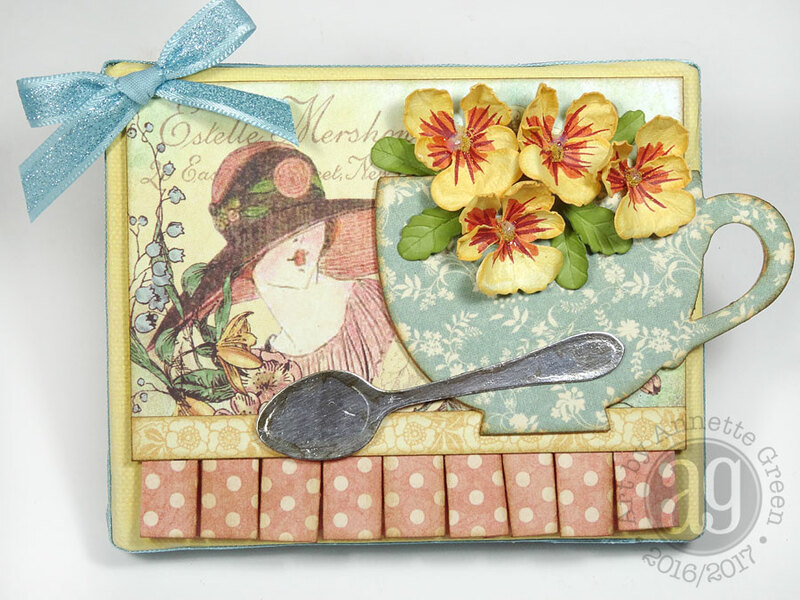 "Tarnish" the silver spoon with a little Mushroom Alcohol Ink and adhere to the canvas. 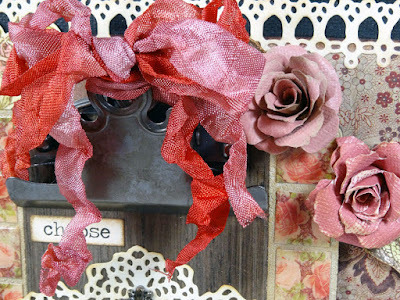 Add some pretty coordinating ribbon around the outer perimeter of the canvas and add a bow to the upper left corner. You're done! A quick gift idea that's super sweet! Thanks for stopping by. Have a fabulous day! Hello everyone. 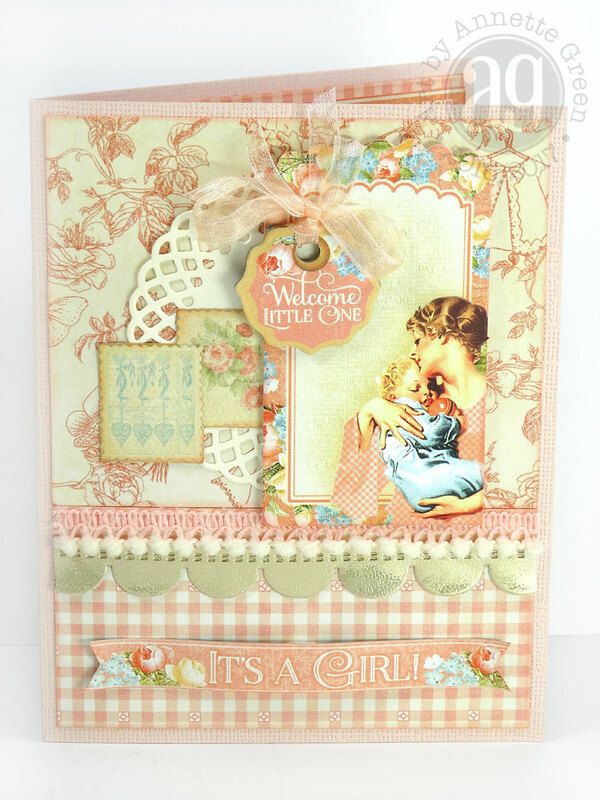 It's almost the weekend and I'm SO looking forward to attending my friend Jen's baby shower. It's their first baby, and I'm so happy for them. Jen is the daughter of my friend Patty who we've known for a long time now. Jen use to babysit our Jamie when she was really little. Now she's going to need a baby sitter! Yay! 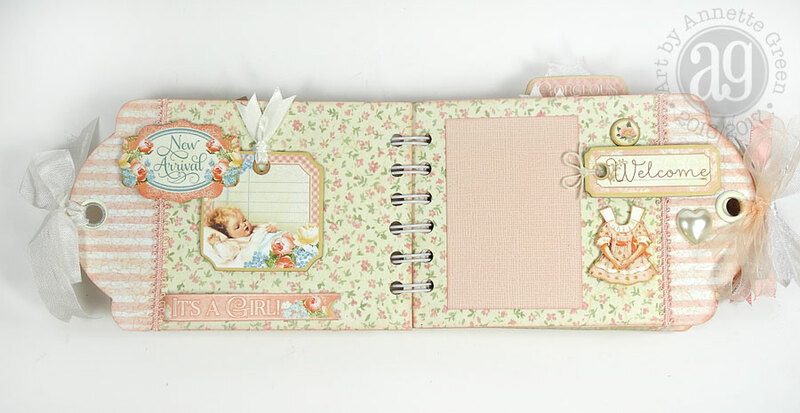 I thought I'd share the mini album I promised to show you, plus a few other baby goodies. There's nothing like hand-making something special for someone you care for, am I right? It's the best feeling the whole time I'm making it. Last week I shared the keepsake box here. 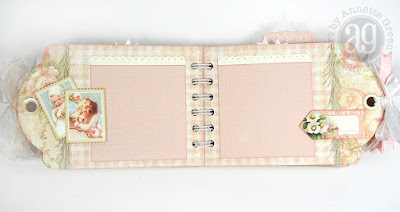 This is where the baby album goes, but Jen can use the box for anything she likes. 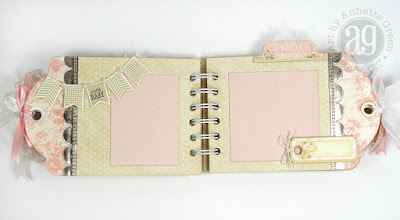 Everything here is made with her baby's color scheme: Pinks, golds, and creams. 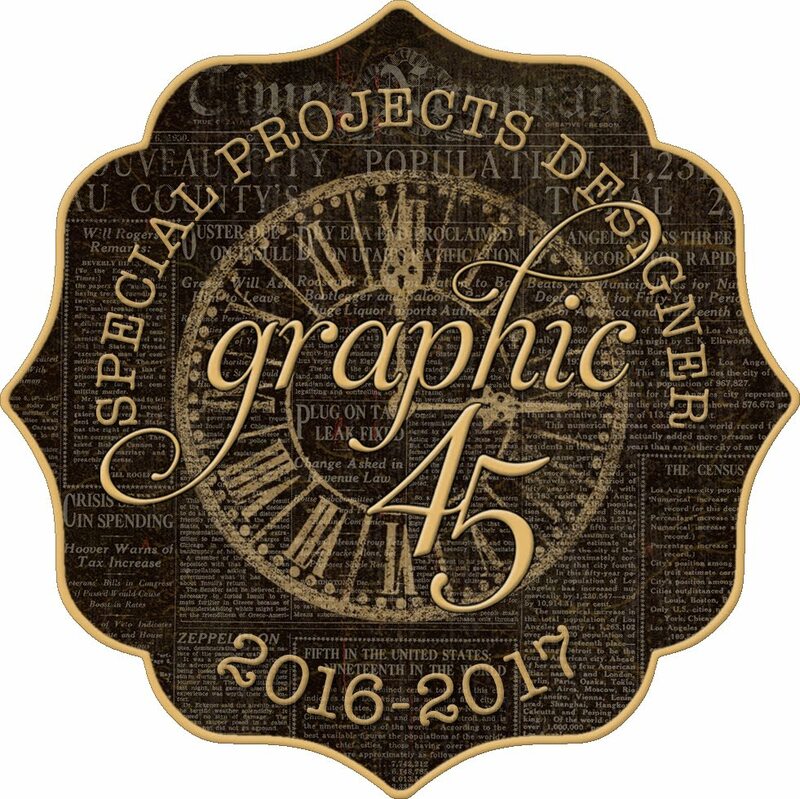 Naturally, the papers I used are from Graphic 45. I actually combined four different collections from my stash. I love that Graphic 45 keeps their palette pretty uniform so we can do things just like this. Something you may not know about me: Back in the day, I sold handmade baby items like blankets, bibs, burp cloths, and lots of other little treasures. 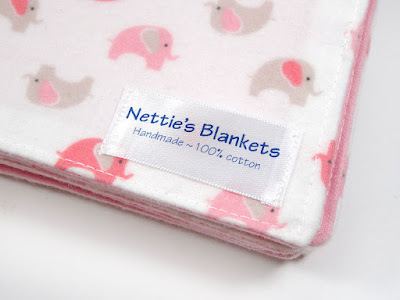 I still have some Nettie's Blankets tags which come in handy on occasion. This sweet flannel fabric is from my local JoAnn's store. I used a pink flannel on the back side. 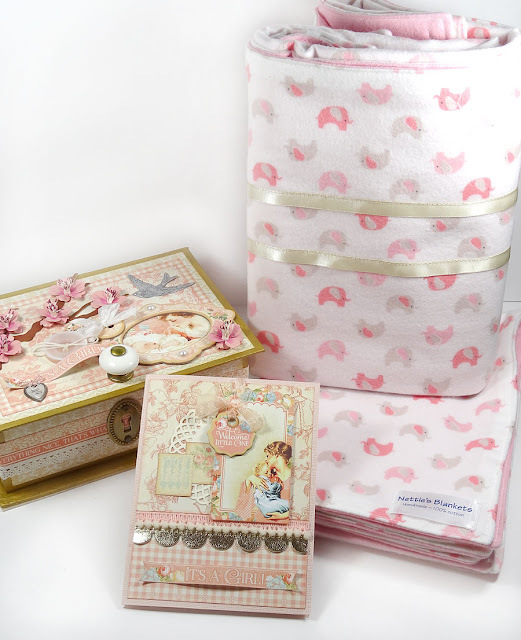 The blanket is a little smaller than crib size and the two burp cloths measure 14" x 18" each. The blanket is just the right weight and warmth for a light covering for baby and the burpies are thick enough to absorb, um... "stuff" without it going through. I used Graphic 45's Ivory Tags and my Cinch machine to bind them together to make this sweet little mini album. 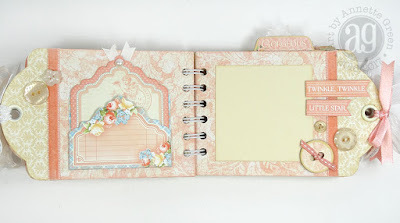 The collections I used are Baby 2 Bride, Gilded Lily, Precious Memories, and Little Darlings. They worked perfectly together. 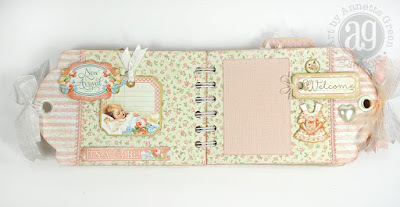 The baby album was so much fun to make. 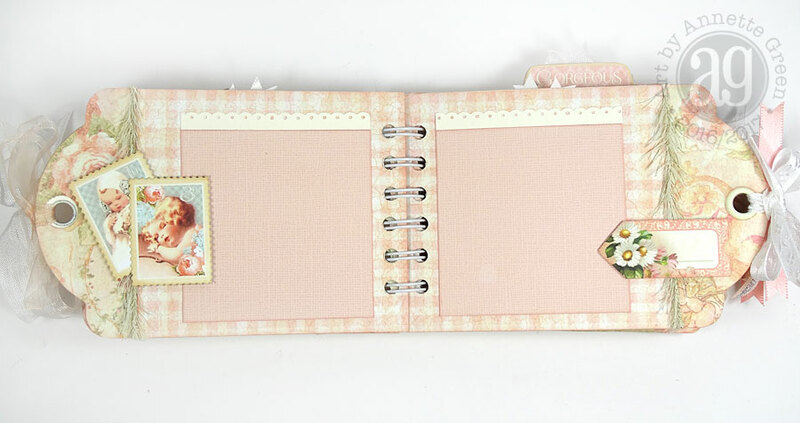 I can't wait until Jen has her baby and puts some photos in here. 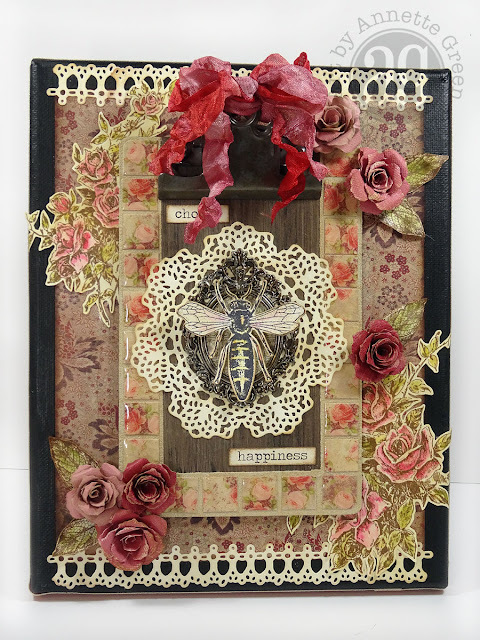 I used mixtures of chipboard and baby embellishments, die cuts and lots of varieties of ribbon. 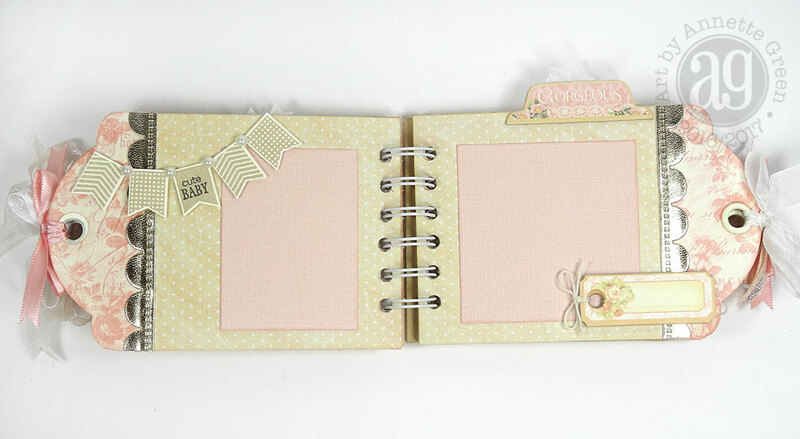 Below are photos of the inside pages. Please click on each photo to get a bigger, detailed view. And let's not forget the card. 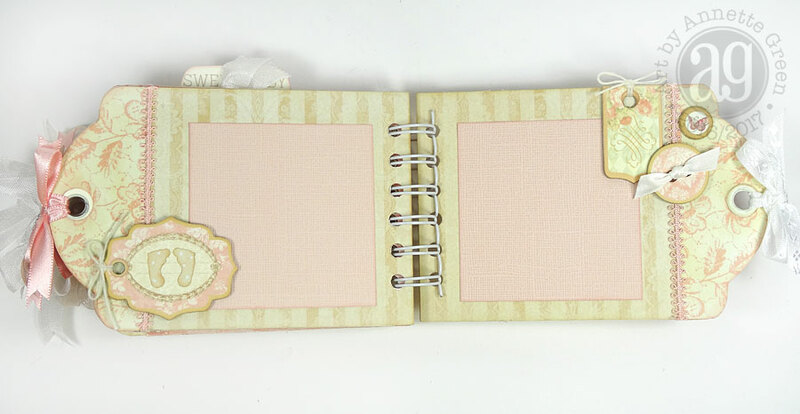 A simple and elegant A2 size, with matching papers and embellishments. I hope you've enjoyed it. I don't get the opportunity that often to make baby things, so when I finally get to I thoroughly enjoy it. Have a great weekend! Thanks for stopping by. Good Monday morning all. I hope your weekend was fabulous. Ours was busy with my Annual Spring Cleaning Craft Clearance Sale which was a huge success (thanks to all who came out)! and then yard work on Sunday in the beautiful Florida sunshine and cool temperatures. 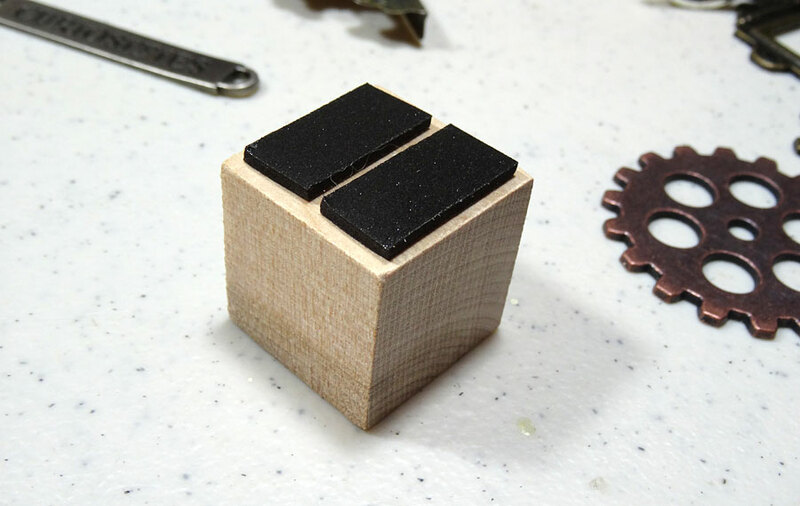 Start with Tim's new Mini Clipboard and remove the hardware from the top. (You'll need a basic screwdriver.) 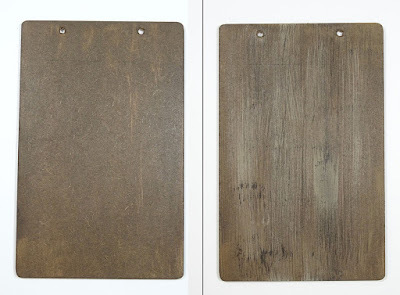 Paint the sides and then the front of the board with Ground Espresso Distress Paint and let dry fully (left), then dry brush streaks of Gathered Twigs DP, let that dry, then dry brush streaks of Brushed Corduroy DP. 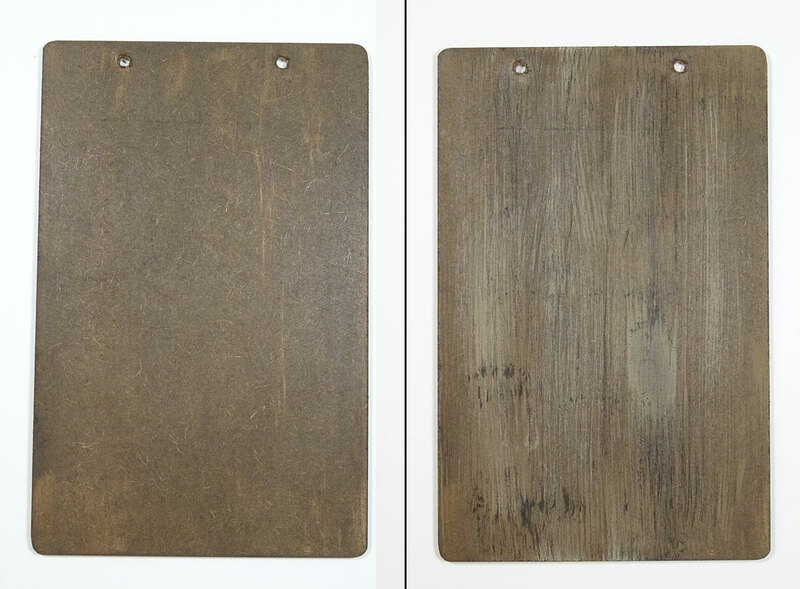 If you like, you can add just a few dry brush strokes of Ground Espresso for depth (right). 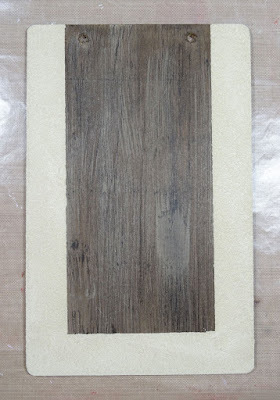 The idea is to create a faux wood look. 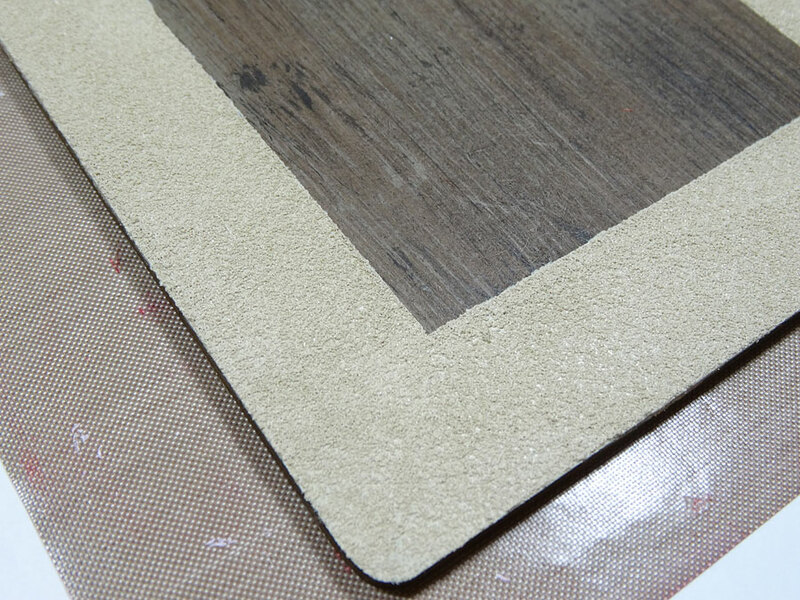 Use painter's tape to tape off all but 3/4" of the left, right and bottom edges. 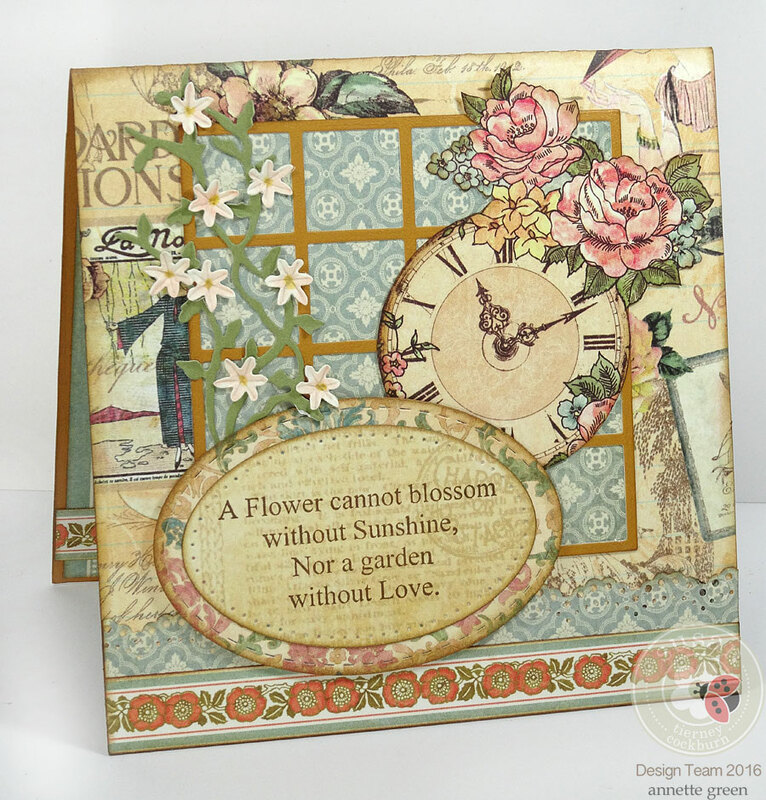 From the Paper Mosaic Kit, mix about two Tbsp. 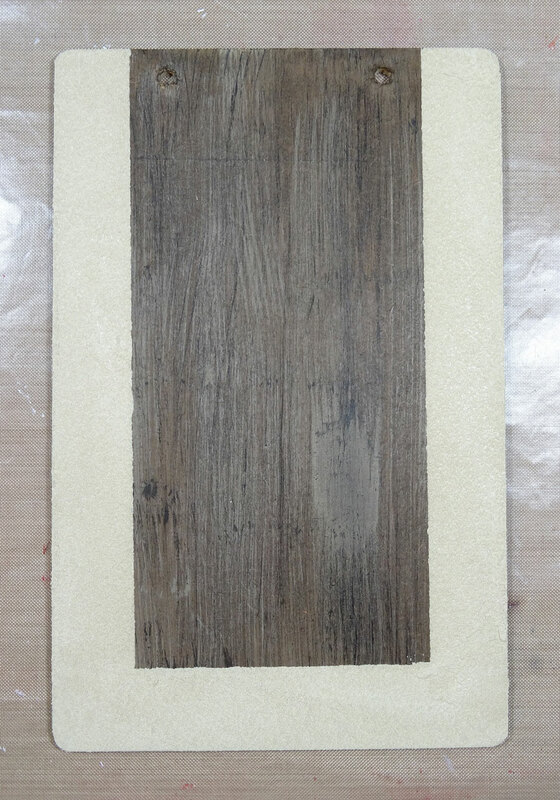 of the "grout" into a small cup with a teaspoon or so of Brushed Corduroy DP to make a colored grout. (Just mix it until you like the color.) Use a palette knife to spread the grout on the outer areas, as shown. It's important to peel up the painter's tape immediately after doing the grout; slowly and gently and you'll get a nice smooth edge. I've spread my grout rather thinly, but you can certainly do it thicker. It just takes longer to set and dry completely. Set this aside while we do some other stuff. Onto ivory cardstock stamp the two large floral images from "Lady Rose" using Potting Soil archival ink. 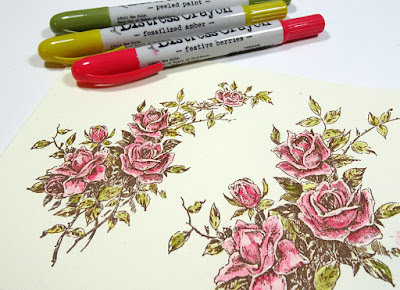 Use a water brush and Distress Crayons to color. I scribbled the crayon onto my non-stick craft sheet and mixed water from the water brush into it. You can layer more color for added depth and shadow. The great thing about using Distress Crayons as opposed to water-based markers is that once the crayon is dry, it doesn't budge. Won't smear or fade if more water or color is washed over it. 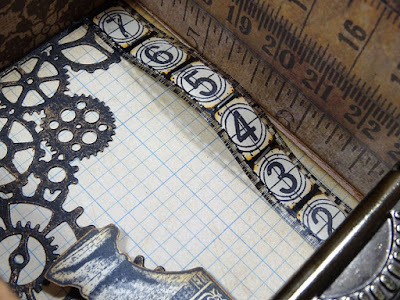 That's a huge bonus for mixed media projects, art journal pages, and such. Fussy cut the florals then brush a thin layer of Distress Collage Medium, Vintage over them. Set aside to dry. This collage medium gives an aged look. 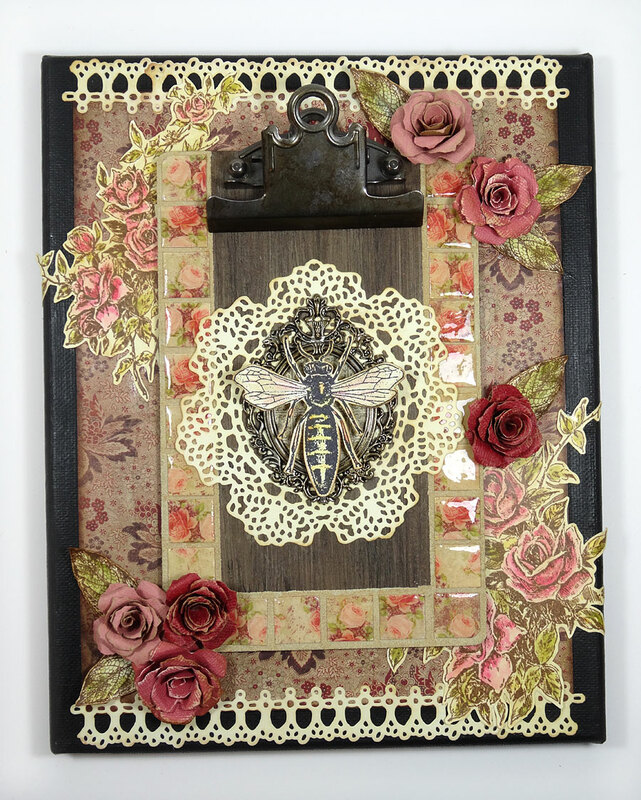 Stamp a large bee from "Art For You" using Jet Black archival ink, and color her as desired using the water brush and Distress Crayons like before. Fussy cut the bee and place two layers of foam tape on the back of the body. 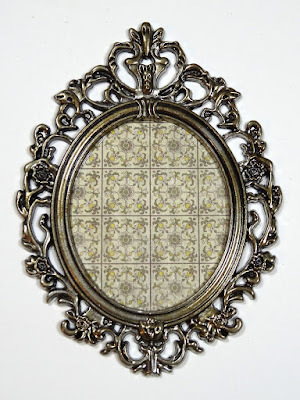 From a 3" x 4" page in the Dapper paper stash, trace the oval inside a Baroque Frame and cut it out a little larger than your traced line. 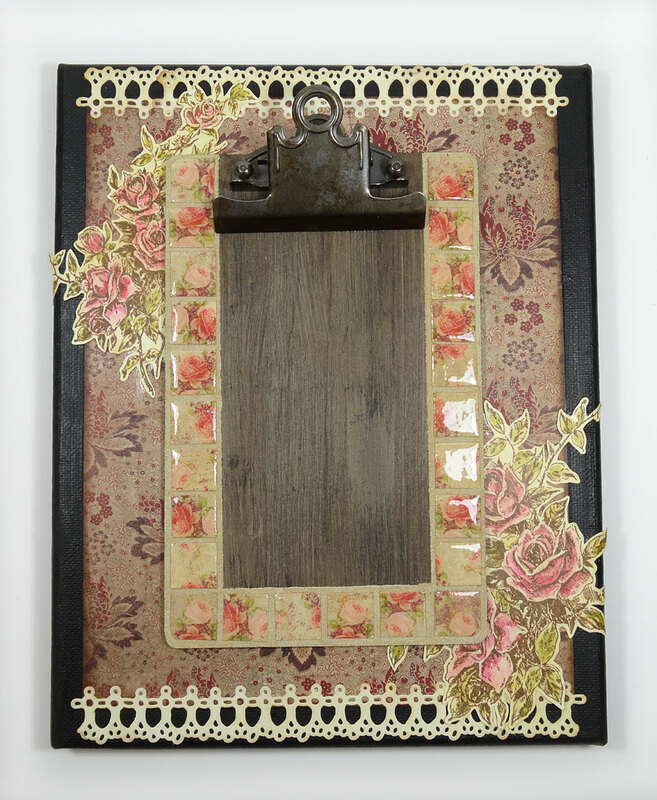 Before adhering the paper oval to the back of the frame, dab Mushroom alcohol ink over the surface of the frame to age it. By now, your grout should be fully dry. (Check it carefully and don't rush this step. And definitely don't use the heat tool to speed it up. This can create unwanted bubbling.) Cut 24 squares 5/8" each from desired paper. I used some vintage rose paper in my scraps. Before adhering, lay the pieces in place onto your clipboard to check the fitting. I had to snip a few squares with my scissors for even spacing. Adhere the squares to the clipboard onto the grout using the "glue" in the Paper Mosaic Kit (left). Set aside to dry a few minutes, then spread a layer of the Collage Medium, Vintage over the entire surface of the board (right). While that step is drying, cut a 7" x 8 7/8" piece of decorative paper from the Dapper paper stash and ink the edges with Ground Espresso Distress Ink. 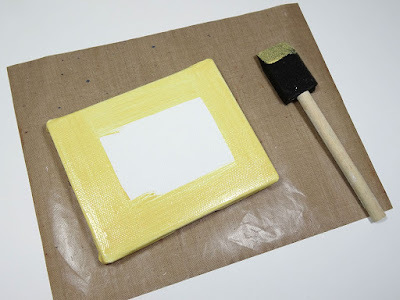 Adhere paper to an 8" x 10" black canvas using Matte Medium, pressing from the back of the canvas with one hand while the other presses from the front side to get a good seal and strong hold. 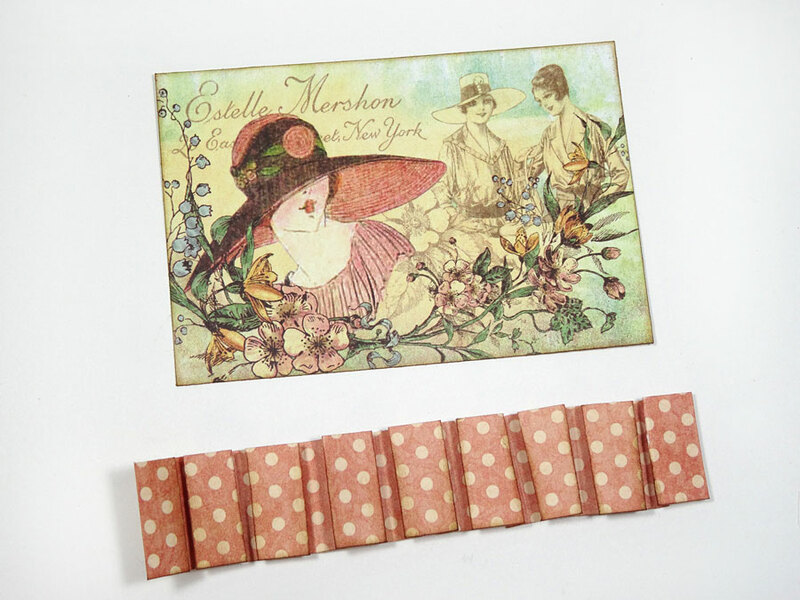 Cut three strips of Lace from ivory cardstock (you'll have to piece them together to get the full 7" length). Ink the surfaces with Antique Linen Distress Ink, then the outer edges with Vintage Photo Distress Ink. Adhere the lace, as shown. Once the Collage Medium is dry, apply the Glaze from the Paper Mosaic Kit to each tile as directed in the instructions. Set this aside to dry completely. 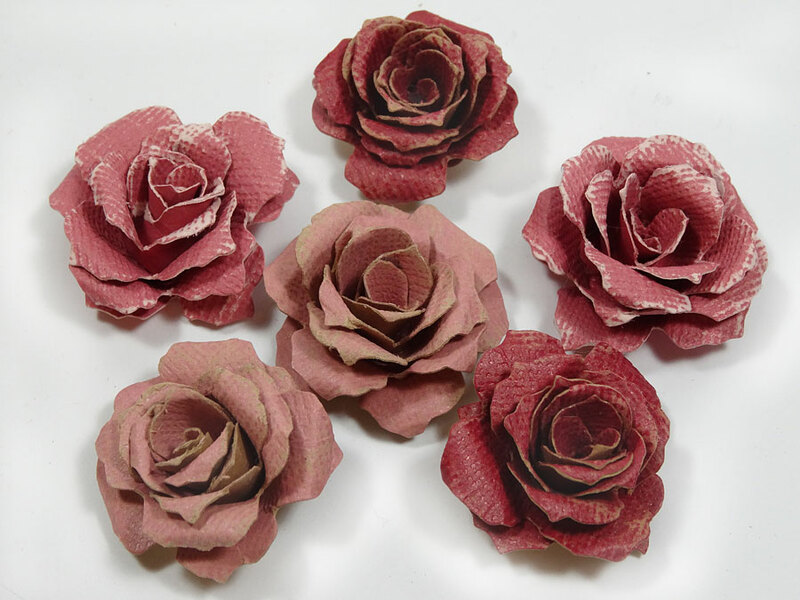 From Kraft Core cardstock, die cut several colors using the Tattered Pinecone die and roll them to resemble roses. Tim has a great video on this technique. 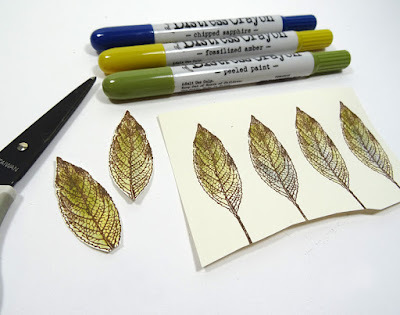 Rather than die-cut leaves from a die, I decided to use stamped leaves. I liked the idea of mixing the feel of stamped and die-cut images, plus I wanted to tie in the feel of the previous stamped florals. Stamp several leaves from "Nature Walk" onto ivory cardstock and color each as desired, then fussy cut each, eliminating the stems. 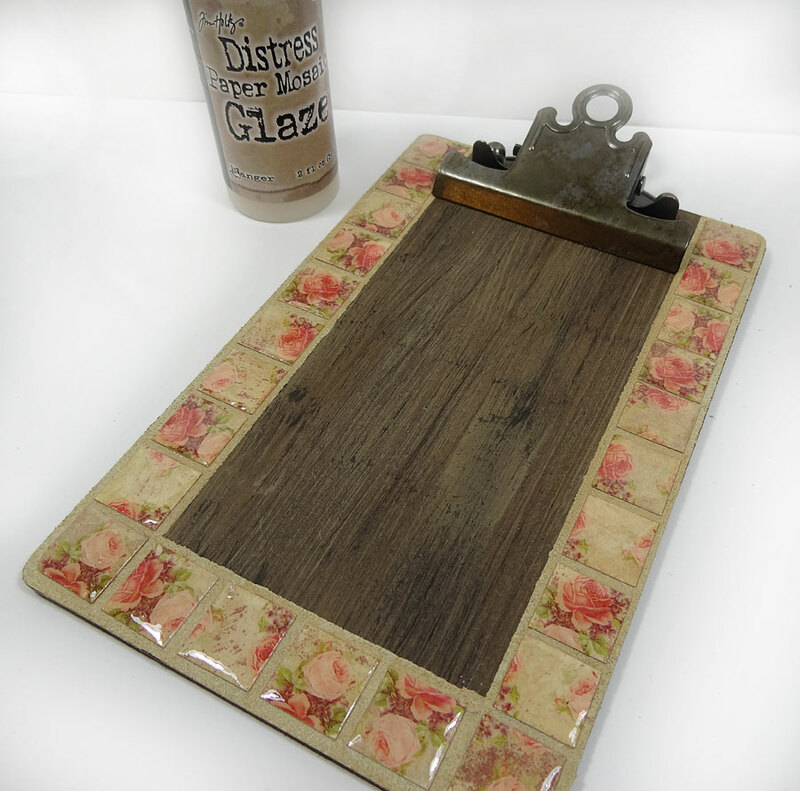 If your clipboard "glaze" is completely dry, you can start to assemble. 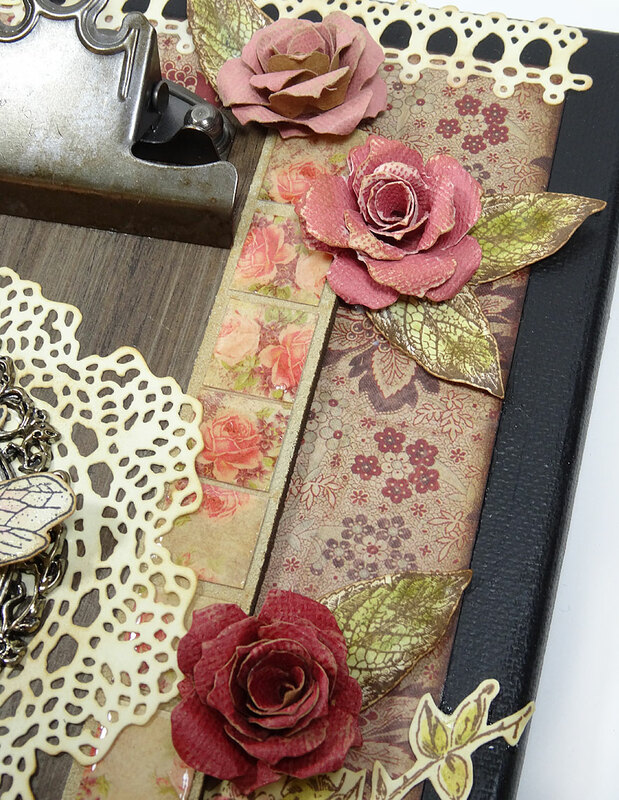 First, apply Mushroom alcohol ink to the surface of the metal clip and, once dry, affix the hardware back onto the clipboard. 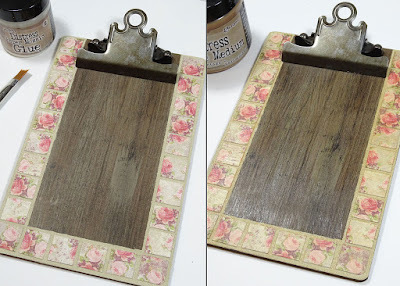 Adhere the stamped florals to the canvas with Matte Medium, then use a stronger glue or hot glue to adhere the clipboard to the center. 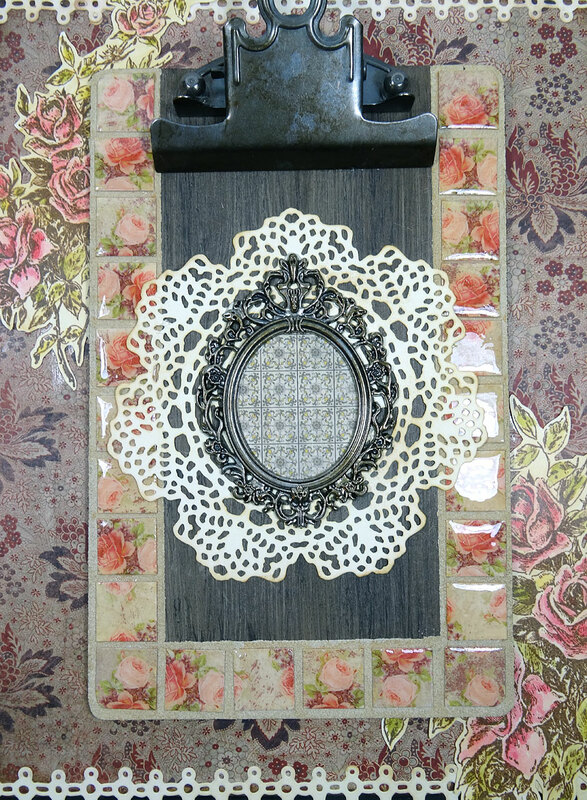 Die cut a large Doily from ivory cardstock and age it with Antique Linen and Vintage Photo like we did with the lace strips. Adhere to the center of the clipboard, then adhere the Baroque Frame. 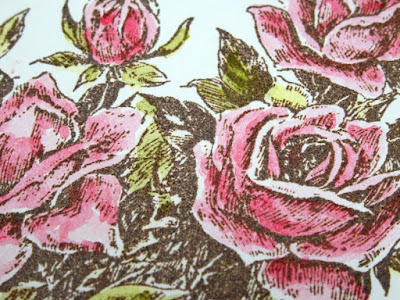 Adhere the roses, leaves and the bee next. 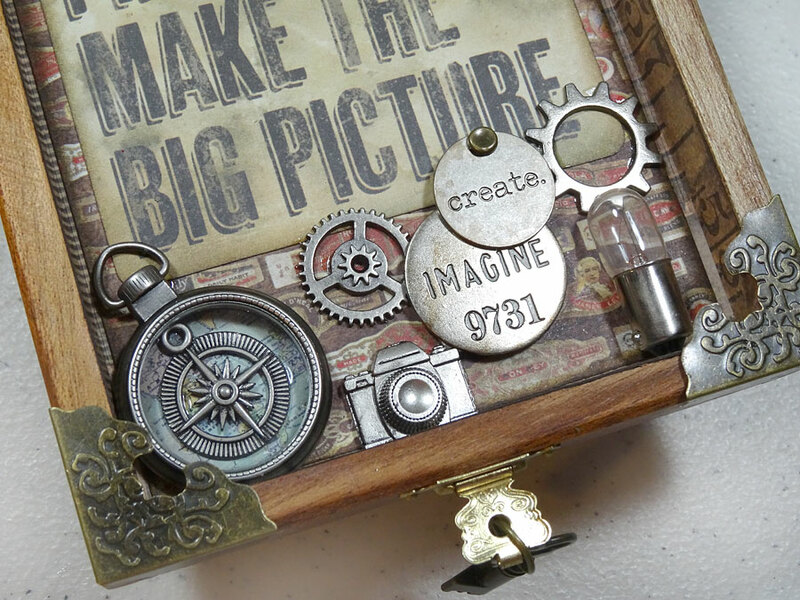 Select some Big Chat stickers for your piece and ink the edges with Vintage Photo before adhering to your piece. 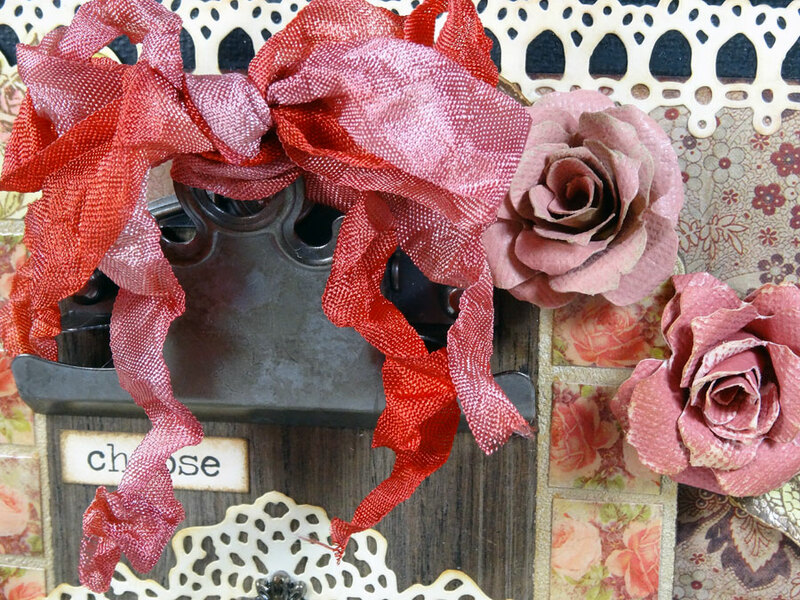 I sprayed two 16" strands of seam binding ribbon: one with Fired Brick and the other with Victoria Velvet Distress Stains. 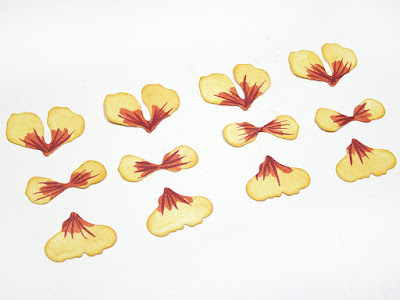 Once dry, I tied them to the hole in the clipboard into a flouncy bow. 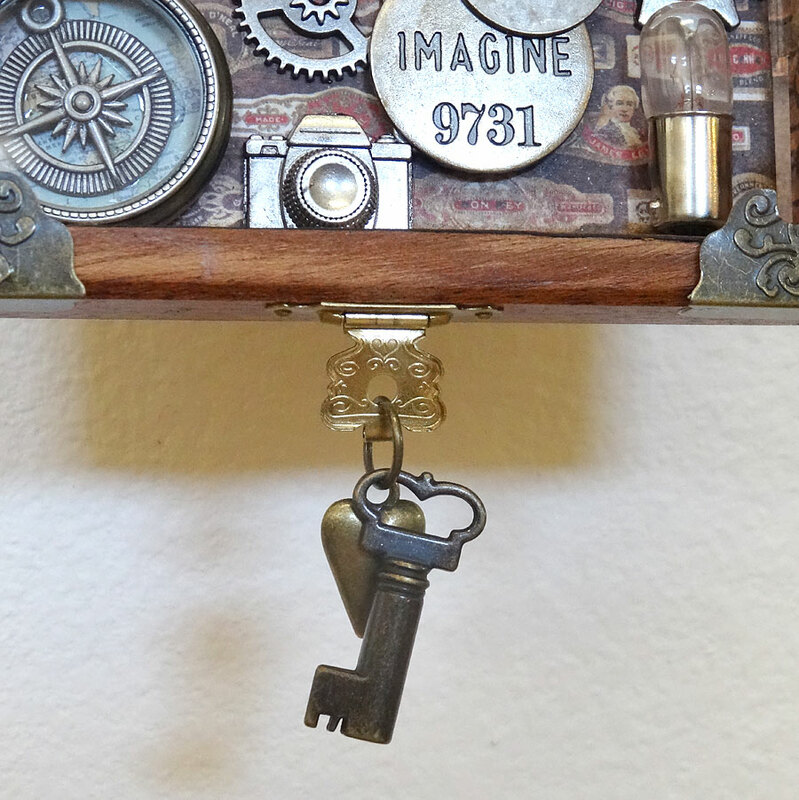 Now you can add some hardware to the back to hang your piece, or simply place it in a pretty display stand on a mantle or table top. I hope you've enjoyed the project today. Remember to always support your local craft and scrapbook stores first when searching for your supplies. Or you can always find all these products at online stores like The Funkie Junkie Boutique. Thanks for stopping in. Have a great day!